Cleaning your windows takes you a great deal time and energy? You can do something different now – simply get in touch with our operators and book our window cleaning in Totteridge. We will manage this matter for you and the results will be appropriate for all parts of your windows – the glass, framework and ledges. With our support, you will have the freedom to do anything you want with the time you usually spend for window washing. But our services will bring you even more, as you can witness from our list of benefits. We also provide our professional services in nearby areas: Oakleigh Park, Highwood Hill, Totteridge & Whetstone, Barnet, Mill Hill. We provide private and commercial window cleaning by using advanced methods. You can rely on our professionalism for all types of glass surfaces, skylights and greenhouses. For windows placed up to your fourth floor, we use water-fed extension poles. This system is comfortable and allows safe cleaning procedures – the poles are attached to the water reservoir in the vehicle. For high-rise windows, our rope access solution will grant you fast and efficient end results. You can gain a lot from these services right now – just call 020 3746 3113 and place an order! You can always rely on our workmanship and devotion for domestic and business window cleaning. Our experience allows us to clean all varieties of glass surfaces you could have at your property. For instance, you can order cleaning of single or double windows, French doors, sash windows, bay windows and patio doors. In addition, we include conservatories and roof windows as part of our routine. So to speak, you can enjoy the good look of your windows with our timely and reliable services. You can be certain that the good look of your business property is certain. The professionals will provide you with superb commercial window cleaning. With the help of our water-fed extension pole system, you will witness swift and splendid washing of all windows as high as the fourth floor. For high-rise buildings, we proceed with our rope access gears. It is our advanced way of reaching glass panes on taller structures. No matter what is the size of your business premise – a humble corner shop or Heron Tower – we will guarantee perfect look of your windows. 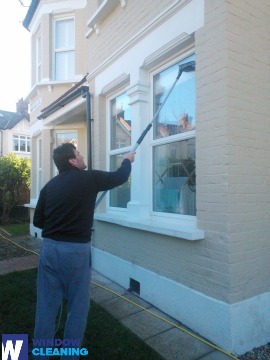 Benefit with our swift and reliable domestic window cleaning in Totteridge. We will clean the windows of your house in and outside. The solutions we use are environmentally friendly - you will love the perfect results and be green aware. Moreover, we use only purified water. Don't hesitate, dial 020 3746 3113 and order our second-to-none services. Our customer representatives will assist you – they are active 24/7. Another ways of booking – our request a cleaner online form or just chat with our representatives. The nearest tube station serving N20 Totteridge is Totteridge & Whetstone.